i am hearing “i just want to be happy” a lot lately. companies, researchers, philosophers are also jumping on the topic. just this morning, i heard that in recent research it has been proven that what makes people happiest is feeling connected to other people. well if you need science and numbers and stuff that’s cool…… but you can also just believe me. j.k….. but, there is a reason why will you continuously hear the same thing (not only from me, but from all my fellow travelers): “the most rewarding part about traveling is the people you meet”. one of my favorite feel-good movies is chasing liberty. ok ok, i will warn you that it is totally a romantic-comedy-teenie movie, but it is one of the good ones! really. anyway…. it is about beautifully spontaneous travel-adventures. and it also touches upon the topic of how important it is to feel connected to other people… new friends, strangers, families (by blood or choice). ben: “what are these? six million dollar man stickers. mc gruff: “these stickers are my contribution to the global community. everyone i meet gets a handful. your job, post post them up. pound one on a door, slap one on a kiosk, place one on a postbox …wherever your life may lead you. mc gruff: “then, nothing. you forget about the sticker. you move on. one day, maybe you’re down in the dregs. and all of a sudden, there it is. in the corner of a window, the door of a subway, the side of a telephone booth. one of the stickers. it puts a smile on your face because you know …you are not alone in the world. We’re all connected. yeah, it’s a bit cheesy and stuff but still true. and even also as a little high school student, far from starting my vagabonding last november, i loved this “contribution to the global community”. i am sure you have experienced magical little moments when the universe presents you with a random connection with another person, that fills your heart with warmth. 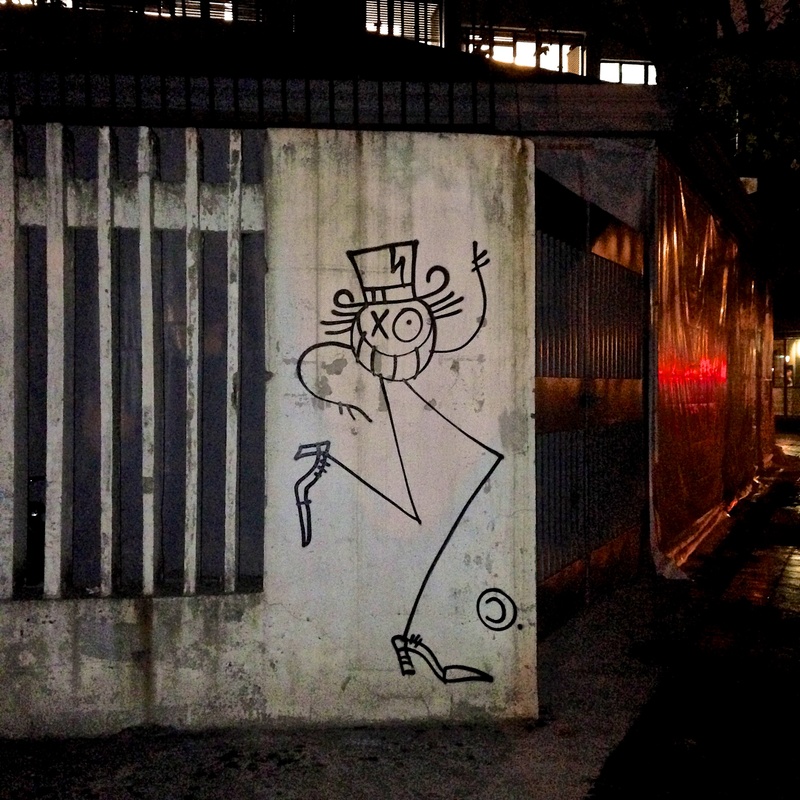 like the time i saw this graffiti, on my way home in shanghai. i couldn’t believe my eyes because it was obviously by the same artist, andré aka monsieur andré aka monsieur a* (i later researched) as one i saw in new york, during one of those… epic nights. and i strongly felt connected to the friend who took this picture of me standing in front of the ny-version of this stick figure.